Are you a fan of Big Band jazz? 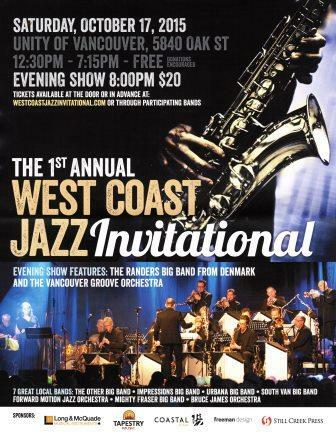 Unity of Vancouver will be the place to be on Saturday, October 17, 2015 for the 1st Annual West Cost Jazz Invitational. This event will feature the music of seven big bands from around the Lower Mainland, along with a special performance by the Randers Big Band from Denmark and the Vancouver Groove Orchestra. The ticketed evening show will feature the Vancouver Groove Orchestra at 8:00 pm and the Randers Big Band at 9:00 pm. Please join us on October 17th for a day of amazing Big Band music.